Eddie Shaw’s Retirement Date Moved Earlier, to March 1! 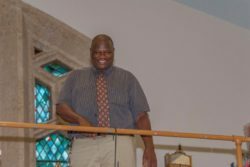 St. Stephen’s Long-time Facilities Supervisor/Sexton, Eddie Shaw, has moved up his retirement date from May 1, the original time, to March 1, 2019. While that means we have to scramble somewhat, we are glad to honor his wishes. We will let you know as soon as a date for his retirement party is set. Mr. Shaw, whom most of us know as “Eddie,” has been the Facilities Supervisor/Sexton of St. Stephen for 34 years. His kindness, thoughtfulness, patience and hard work have been a blessing to St. Stephen’s members and friends and will be sorely missed. There are a number of ways that you can show your personal gratitude for Eddie’s service to the church. The session has set up a Specials Fund in his name to receive financial gifts to give Eddie out of gratitude. Donations to that account are a potential tax write-off for the giver. You can give to this fund either by writing a check to St. Stephen Presbyterian Church with the memo “Eddie Shaw Fund” or by going to the “Donate” button at www.ststephenpresbyterian.com. However, it’s worth noting that the best way to give Eddie a financial gift is to give him a check or cash directly. We will let you know of other ways to give to Eddie to show your appreciation for the ministry he has performed for us over the years! The session has authorized the formation of a Facilities Supervisor Search Team comprised of chairman Eduardo Calderon and Elder Walker Armistead, representing the Property Committee; Elder Molly Hale and Nancy Ricker, representing the Personnel Committee; Charlotte Ray; and Kurt Anderson. Rev. Ritsch and Elder Bill Curtis, chair of Personnel, serve as ex officio. They have developed a job description and a salary and benefits package, approved by session, and have begun advertising in the Star-Telegram, indeed.com, and the air base, among other places. The goal is to begin interviews by the last week of February and to have someone in place as soon as possible in March. However, there’s no guarantee that it will happen that quickly. It is our hope that we can manage without having to hire an interim sexton. Clean Slate, the cleaning service from the Presbyterian Night Shelter who take care of our housekeeping, will continue its work. Eduardo Calderon has developed a calendar of activities, placed in the church office, for volunteers to do necessary work around the church. We ask that if you participate in any activity in the church building that each group take responsibility for their own set-up and clean up until the new person is in place. It’s a good opportunity to know what it is you need for your events. In that way you can train our new sexton how to do the jobs you need done.